Giving thanks: Carmelite Father Thomas Pulickal is farewelled by members of the Holy Family Parish in Gulliver. WHEN a community says goodbye to its parish priest, there are many memories shared. But when a priest leaves a parish to go home to his mother country, it is far more heartfelt. Carmelite Father Thomas Pulickal arrived in Townsville in November 2012 from India where he had lectured at the Carmelite seminary in Liturgy. Upon arriving he was appointed assistant priest in the cathedral parish. In 2015 he was then appointed as administrator of Holy Family Parish in Gulliver. In a letter to Fr Pulickal, diocesan administrator Fr Mick Lowcock thanked him for his dedication to his vocation while in Townsville. “During his short time here in our diocese he has undertaken several extracurricular duties as a member of the Diocesan Liturgical Commission and master of ceremonies for diocesan liturgies, chaplain to the Townsville Hospital and was the co-ordinating chaplain to the Syro Malabar community in Townsville,” Fr Lowcock said. “Wherever Fr Thomas has ministered, he has endeared himself to the people he served with his quiet and patient nature. Fr Pulickal said his time in Townsville and Australia had brought him many blessings. “I must say that I really enjoyed my ministry in the community and they allowed me to implement a number of different programs for which I am truly grateful,” he said. 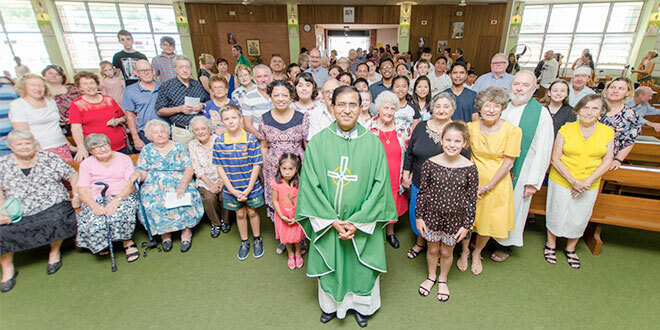 A spokesperson for the Holy Family Parish said: “The Indian community, not just at Holy Family, but in the whole of Townsville will also no doubt feel a great sense of loss. “The Australian life and culture is very different from that of my country, the people are very polite and gentle and I will miss them greatly, especially the priests and this beautiful country,” Fr Pulickal said.